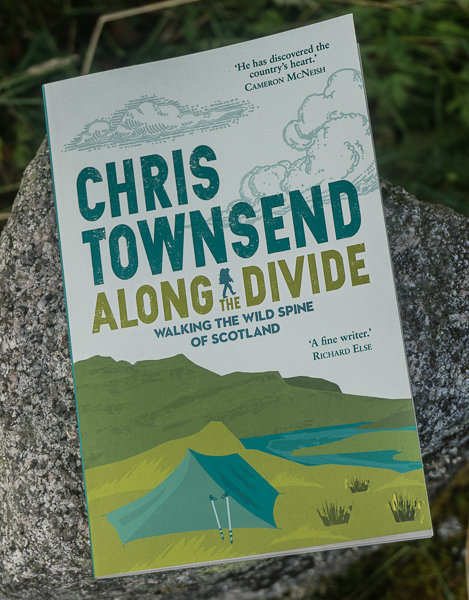 This Saturday (October 3) I am giving an illustrated talk on my summer long walk over the Munros and Tops at the East Perthshire Walking Festival. The talk is at the Royal Hotel in Blairgowrie and starts at 8pm. Admission is £3. This will be a traditional slide show – yes, projected film not digital images – as my walk took place in pre-digital times and I haven’t had the time, money or desire to digitise the photos of the walk. If you’re in the area please come along and say hello. I’ll be available for questions and conversation afterwards and will have some books for sale. 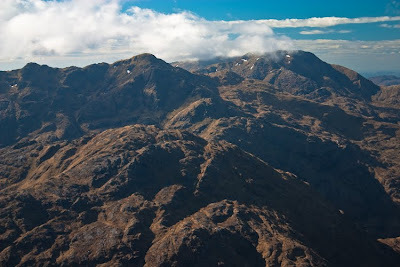 Photo info: The Munros of Knoydart, photographed on the TGO Challenge in May this year. Canon EOS 450D, Canon EF-S 18-55 IS@29mm, 1/250 @ f8, ISO 200, raw file converted to JPEG in Lightroom 2.4. View over Strath Nethy to Bynack More from the slopes of Cairn Gorm. 1/640@f5.6. ISO 64. Raw file converted to JPEG in Lightroom 2. 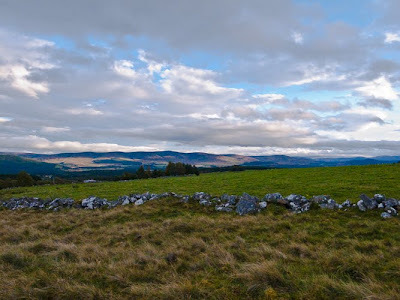 View over Strathspey to the Cromdale Hills. 1/1000@f.5.6. ISO 800. Raw file converted to JPEG in Lightroom 2. 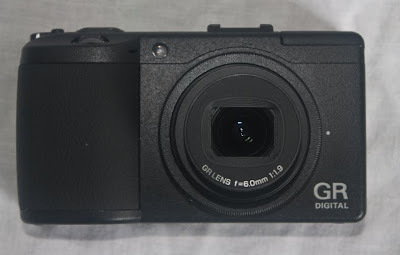 The GRDIII has now had a fair bit of use since my initial comments on the camera (see post for August 14). Other new cameras have appeared too, most noticeably the Panasonic GF1. Using the camera over the last month – in places varying from the Cairngorms to Edinburgh - has been a pleasure but the image quality, especially at high ISOs, is a drawback. Taking pictures with the GRDIII is a wonderful experience. Viewing them on the computer afterwards raises some questions. The GRD III has a tiny sensor and in common with other small sensor cameras at high ISOs there is more noise than in cameras with bigger sensors and even at low ISOs results aren’t quite as detailed. I compared raw images from the GRD III and the Sigma DP1, which also has a fixed 28mm lens but a much larger sensor (subscribers to Backpacking Light.com can see my DP1 review here). At every ISO speed the DP1 images are sharper and more detailed. This becomes more noticeable the higher the ISO. At ISO 64 and 100 there is virtually no noise in the GRDIII images, they are just slightly coarser looking than those from the DP1. By 200 ISO noise is visible and by 400 it’s prominent. At 800 it’s intrusive. At 800 ISO the DP1 images are cleaner and less noisy than the GRD III ones at 400 ISO. For good results ISO 64 and 100 are best with the GRDIII. This is a criticism of all small sensor compacts of course and not specifically the GRD III. It must be said though that the DP1 images are noticeably higher quality. Ironically, the DP1 is a far inferior camera otherwise, awkward to use and with several poorly designed features. A DP1 size sensor in a GRD body would be a wonderful camera! The big attraction of the GR series for hill walking and backpacking is the light weight and small size combined with high image quality for a small sensor camera. However the DP1 is only slightly bigger and heavier. The GRD III is as easy to use as the original GRD with most settings accessible without having to delve into menus with a series of button presses. The main controls are a dial on the top of the hand grip and a rocker switch on the back of the camera. The first controls the aperture, the second the shutter speed, with a bar on the screen showing how changing them alters the exposure. There’s also a menu button the back surrounded by four arrow buttons, one of which switches the macro option on and off and one controls manual focus. When viewing images the arrows are used to scroll through them. Also on the back is a button that switches from live screen to image display, a combined self timer/delete button and a display button that varies what can be seen on the screen. With all options visible the screen shows all the information you could require, including live histogram, battery life, number of shots left on the memory card, ISO, shooting mode and, depending on the mode, aperture and shutter speed. New here is an electronic level, which is very useful for ensuring lakes and seas are level and not pouring out of the picture! The live histogram is very useful too – I use this as my main guide to exposure, which is usually set on manual. So you don’t have to go into the menus for all other controls four of them can be chosen to appear on the screen when the rocker switch is pressed. I selected ISO, White Balance, Image Quality and Focus for these. The screen itself is clear and sharp though as with every screen I’ve used it can be hard to see in bright sunshine. 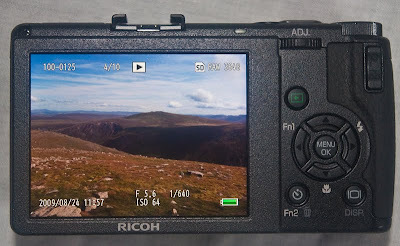 Ricoh offer an optional viewfinder – the GV2 - and I recommend this, although it is expensive at £95. Apart from being able to see what you are photographing clearly, using the viewfinder also means you can have the camera to your eye with your elbows tucked in at your sides, which is better for stability than holding the camera in front of you. A new feature on the GRD III is the Dynamic Range Double Shot mode, first introduced by Ricoh on the CX cameras. With this the camera takes two shots at different exposures and combines them, gaining greater dynamic range (the range of brightness that can be recorded) than is possible with a single shot. When the sky is really bright and the land dark this is a useful feature. However you need steady hands and a high shutter speed to use it handheld. Ricoh advises a tripod. Also, it only works with JPEG not raw images. Test results with the DR feature shows that it does make a difference but not enough in my opinion to justify carrying a tripod. The GRD III uses tiny SD or SDHC memory cards, which weigh a mere 2 grams each. A 4GB card will hold 204 raw images and 957 fine JPEG images. One problem with the original GRD was that it took many seconds to write images to the card (it’s surprising how long 13 seconds seems when you’re waiting to take another picture). With the GRD III even raw images only take a couple of seconds. Power comes from a rechargeable battery. Ricoh say that fully charged it should last for around 370 images. That accords with my usage though I haven’t used the camera in cold conditions. Batteries weigh 26 grams so spares could easily be carried with little weight penalty. The GRD III is not a point and shoot. It’s designed for the photographer who like control over their camera. For walkers who want this it’s worth considering, especially as image quality is good for a small sensor camera. However it is expensive at around £530 and there are alternatives that have larger sensors like the DP1 and the newer DP2 with 40mm equivalent lens and the micro-four thirds cameras with interchangeable lenses such as the Olympus E-P1 and Panasonic GF1. All these will produce higher quality images than the GRD III. When the original GRD appeared it was arguably the best digital compact, both in terms of ergonomics and image quality. The GRD III still leads with the first of these but no longer with the second. Hoping to catch the last of the sunny weather of mid-September, the first settled spell since June, I headed out to the hills at the end of last week. Not having been there for a few years I went to the big hills that rise dramatically above the West Highland Railway as it starts the crossing of Rannoch Moor. Arriving late I walked along the track by the Water of Tulla in the dark. There was no moon and bright stars shone in the black sky. I needed a headlamp to avoid the holes and rocks on the rough track. Shining the light across the surrounding moorland I caught many pairs of bright eyes staring back at me, followed by the sound of animals moving away. Then came the guttural roaring of a rutting red deer stag, one of the thrilling sounds of a Highland autumn and the first I’ve heard this year. The air was chilly and every so often a band of damp mist drifted over me, making the beam of light from the headlamp bounce back at me and the world look hazy and unsharp. 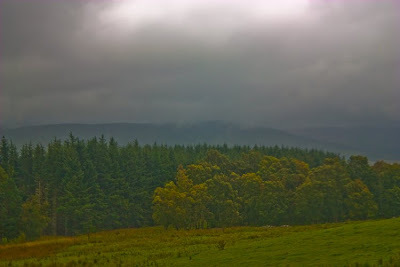 By the time I reached the little bothy where I would spend the rest of that night the mist had dampened my clothing. But the stars spoke of clear skies and sunshine. It was not to be however and I woke to a grey day with a high sweep of cloud covering the sky. A chill wind swept down the glen. There were hints of yellow and red in the leaves of the trees lining the Water of Tulla and the rowans were heavy with red berries. I climbed hillsides of purple heather and grasses fading to pale yellow and red. On the tops the wind was bitter and I wore a warm hat and gloves for the first time in many months. The summits came and went in the clouds, giving brief views over the watery expanse of Rannoch Moor and of the dark shapes of other hills hanging in the moving air. I camped just below a col in the shelter of a small knoll. Or at least it was sheltered with only the occasional gust of wind when I pitched the tent, just as the first rain began to fall. In the early hours of morning I was woken by the wind shaking the tent. I dozed on and off until dawn, listening to the rain increasing in strength and feeling the wind moving the tent against me. Back on the col I felt the full force of the wind with gusts that were hard to walk against. I climbed one quick summit then decided the weather was too bad to be worth continuing. I was back at camp in an hour and heading down the hill half an hour after that. The first storms of autumn had arrived. On the descent I met a few parties of day walkers heading up, all clad in waterproofs and warm clothing. “Rain’s supposed to get heavier”, said the first. “Supposed to clear up this afternoon”, said the second. “Why does it always rain?”, said the third. I sloshed down the muddy trench of a path and drove north across an invisible Rannoch Moor, just grey sheets of rain sweeping over the road all that was in sight. Summer is over. 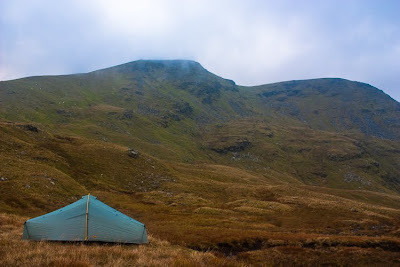 Photo info: A wet and windy camp below Beinn an Dothaidh. Canon EOS 450D, Canon EF-S 18-55 IS@20mm, 1/40 @ f5.6, ISO 400, raw file converted to JPEG in Lightroom 2.4. Twenty-four years ago I spent nearly six months hiking 3,100 miles from Canada to Mexico on the Continental Divide Trail, a wonderful wilderness adventure through the Rocky Mountains. Back then the CDT was a trail in name only with few signs and no waymarks. There were guidebooks with suggested routes to the northern sections but none for the southern 1,000 miles. In places there were long cross-country sections, at others road walks, though the latter were mostly quite brief. This made the walk exciting and challenging. That hike was supported by the outdoor clothing company Rohan, whose owners were good friends, and I wore Rohan’s then radical polycotton synthetic insulated clothing throughout the trip. A longer piece I wrote about the CDT and the clothing has just been published on Rohantime. Photo info: In the Rocky Mountains, Montana on the Continental Divide Trail, 1985. Pentax MX, Tamron 35-70 lens, Kodachrome 64. Scan adjusted in Lightroom 2.5. Last weekend was spent celebrating another decade of life passing by. Ten years ago a group of friends gathered in the hills of the Lake District for my fiftieth birthday. This year we went to one of the flattest places in northern England, the seaside resort of Southport on the Lancashire coast. I was brought up near here at Formby and my mother and one of my brothers and his family still live in the area. It was so that my mother could be present that I went to Southport. Saturday we gathered in a function room in a pub – the Blundell Arms – for talking, drinking and eating. Many of my old friends had not seen each other for many years and the air was thick with reminiscing. Ten years previously we had been in the Old Dungeon Ghyll in Langdale. And the next day some of us had headed up onto the fells. This year the only hills within many miles were the little sand dunes abutting the wide flat expanse of the vast beach that spreads from Southport to Liverpool. It was to the beach we went, to Crosby where the 100 iron men of Anthony Gormley’s Another Place are dotted over the sand from high to low water. Once identical these figures are showing the slow effects of time in changes wrought by the weather and the sea. The iron is rusting, barnacles cover those parts more in water than air, seaweed crawls up legs and twists round feet, faces lose definition and become spooky and alien. Wind blown sand has started to bury some of the figures while with others the wind has scoured away the sand revealing the plinths on which they stand. Beyond the motionless, rigid, dark figures giant pale wind turbines rise out of the sea, slightly hazy, slightly ghostly. These too were still, despite a breeze. Beyond the turbines to the north the sand and sea spreads out to the sky and the simple trilogy of golden rippled sand, dark wave streaked water and paler cloud streaked air is vast, fading into the distance without ending. Turning south the landscape changes and becomes jumbled, complicated, a mass of confusing shapes that are all angles and hard lines. This is Liverpool and the shapes are cranes, cathedrals, sky scrapers and more wind turbines, these ones turning. It’s a much more intense, closed-in landscape than the spaciousness of the sea and skyscape. Turning from one to the other was turning from the freedom and wildness of nature to the restrictions and confinements of the city, both available at a glance. The first is where I live in my head and where I have spent much of my life but I would not be without the second. My friends and family had come together from all over Britain, some travelling long distances. I am aware that modern urban civilisation had made this possible. Reconciling the urban with the wild is a never ending, never completed task, a constant balancing of desires and dislikes as I move through both landscapes in time as well as space. 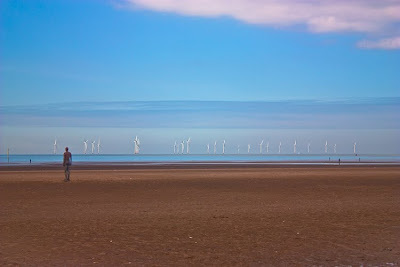 Photo info: Iron Men & Wind Turbines, Crosby Beach. Canon EOS 450D, Canon EF-S 18-55 IS@55mm, 1/640 @ f5.6, ISO 100, raw file converted to JPEG in Lightroom 2.4. Just out is a new little volume in the Classic Munros guidebook series. 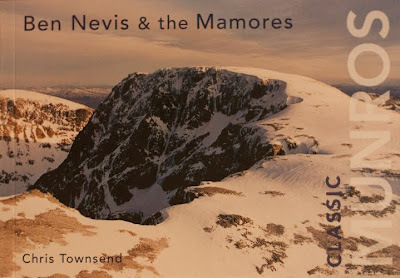 This one, Ben Nevis & the Mamores, covers 17 Munros in the area, with Aonach Mor and Aonach Beag and the Grey Corries as well as the hills of the title. It's illustrated with photographs by Colin Baxter (also the publisher), Alan Gordon and myself plus maps by Wendy Price. For those who wonder what constitutes a "classic" Munro (the series won't cover every Munro) the answer is that I decide (well, someone has to) and I base my decision both on my opinion of the hill and the quality of possible routes. The previous volumes in the series covered Glen Coe and the Cairngorms. Future ones will cover Skye next spring and the Southern Highlands next summer. So the great Munro revision has happened, and Sgurr nan Ceannaichean, a pleasant if not that distinctive hill rising above Glen Carron, has been found to miss the all important 914.4 metre (3,000 feet) altitude by one metre and so is reclassified as a Corbett. 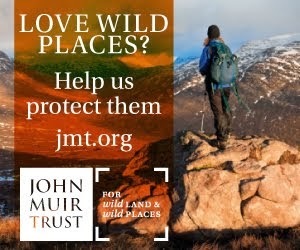 The other hills surveyed - Munro Beinn Teallach above Loch Lagan, Munro Ben Vane above Loch Lomond and Corbett Sgurr a'Choire-bheithe in Knoydart - all retain their current status, though only by 0.2 metres in the case of the first. The last misses Munro status by just under a metre. 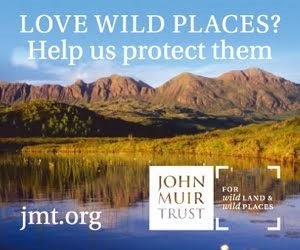 All this has been discoverd by The Munro Society in field surveys carried out earlier this year. The reason is to have accurate lists - and not to sell more guidebooks and maps, as some cynics have suspected. The Munro Society doesn't sell anything and its members spent their money and time to do the surveys - and will do so again next year to check other hills near the magic cut-off altitude. Of course the Munro and Corbett guidebooks are all out of date now but one page inserts should do to explain the new position at least until the Munro Society has finished its surveys. Then will be the time for new editions. Does all this matter? Of course not. Except as part of the game of collecting summits. The hills don't change and I would argue strongly that the finest and wildest of the four hills resurveyed is the lowest. It`s certainly the remotest and hardest to climb. Having lists sets targets and can act as an inspiration to go out in poor weather - which in itself can result in some wonderful days as well as some miserable ones. Changes in the lists are not that important. Since I started climbing the Scottish hills over thirty years ago there have been several changes to both the Munros and Corbetts lists. And none has made any significant difference. Of course if you just dash up to the top by the shortest route and the tick in the book is all then one or two hills more or less might seem to matter. But ticking off the hills should only be the superficial reason for climbing them. Exploration, beauty, adventure, nature, wildness, freedom are all far, far more important. So don`t forget Sgurr nan Ceannaichean. It's just as worth climbing as it was two days ago when it was a metre higher. Photo info: Sgurr a’Choire-bheithe. Canon EOS 300D, Canon EF-S 18-55@55mm, 1/125 @ f5.6, ISO 100, raw file converted to JPEG in Lightroom 2.4. The weekend just gone saw the annual Mountaineering Council of Scotland AGM and Gathering at Glenmore Lodge in the Cairngorms. As President I attended five meetings at which much business was done involving resolutions and motions and other unexciting sounding but essential stuff. There was some voting and an election too. The result is that we have a new streamlined and more flexible structure that should prove more efficient and simpler to run than the old one. In between the meetings I went to an excellent presentation by Geoff Monks of the Mountain Weather Information service, who answered a series of questions with detailed explanations (but not too technical for none meteorologists) that showed just how difficult it is to predict mountain weather when one glen can be dry and the one just a few miles away wet due to the complex nature of the interaction of terrain and air movement. After the AGM leading Scottish climber Dave Macleod gave a very interesting talk about his motivations for climbing and his latest project, a 500 metre route on the sea cliffs of Hoy in Orkney. This climb is still to be completed and Dave is reporting on it on his blog. The scenery looks spectacular, the climbing terrifying and the whole venture exciting and committing. Just descending to the base down wet, slimy and slippery looking rocks and vegetation looks hazardous enough. And then there are the fulmars on the cliffs vomiting up fish oil at you, just to add another element of wild nature. Sunday morning saw more meetings while outside the clouds were low over the hills and drizzle filled the air. Once the business was over I wanted to go up into the hills to shake my head free of paperwork and organisational details and to remind myself just why the indoor stuff is necessary. The forecast was for a clearance in the afternoon, though with winds strengthening later. Watching and waiting for this to occur I had an early lunch/late breakfast (fried egg roll and coffee) in the Glenmore Café, from where I could watch the red squirrels and birds on the network of feeders and ropes just outside and look up at the grey clouds sweeping over Cairn Gorm. Inevitably other MCoS members drifted in and discussion of the AGM and the future continued. Then, as the drizzle died away, the clouds rose above the summits and the sky showed bits of blue and touches of sun I headed across the mouths of Coire an t-Sneachda and Coire an Lochain. The burns running out of these great rock-backed bowls were white water torrents, foaming and splashing down the rocks, heavy with the recent rains. A rough path led up the side of Coire an Lochain and onto its parent peak Cairn Lochan. A strong and cold south-west wind swept over the stony expanse of the broad summit. All the hills to the west and the south were still thick with cloud. Only those to the east were clear and beyond them the sky lightened and shone. I guess it was a lovely sunny day on the coast. The wind and the cloud turned me away from my idea of heading for Ben Macdui and I turned east, along the tops of the corries, gazing down gullies to the little blue lochans far below. That these were full showed the wetness of the summer. Often at this time of year they are shrunken and diminished. Rock climbers were edging up the top of an arête on Stob Coire an t-Sneachda. A scattering of walkers, most clad in hats, gloves and waterproof jackets, dotted the slopes. 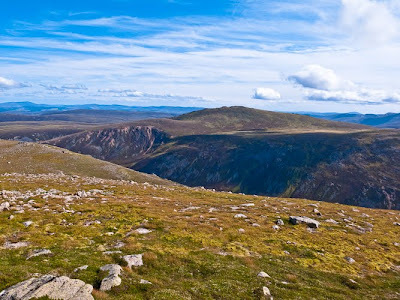 The sun strengthened again and with the promise of late good light I ambled up Cairn Gorm but by the time I reached the summit the clouds had regained dominance and all was dull and flat. So I ambled back down again and descended the Fiacaill a’Choire Chais. These familiar hills, visited many times every year, had worked their magic again, as they always do. It is to protect them, to ensure they are there in the future for others to enjoy as well as for us now that the meetings and papers and discussions are needed. 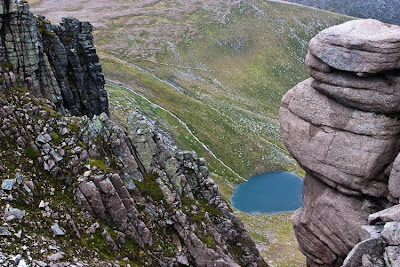 Photo info: Looking down into Coire an Lochain from Cairn Lochan. Canon EOS 450D, Canon EF-S 18-55 IS@29mm, 1/250 @ f5.6, ISO 400, raw file converted to JPEG in Lightroom 2.4. The rains finally eased during the morning of September 4 though showers continued throughout the day and the clouds remained low and threatening. Only after dark did the sky start to clear. A bright moon appeared to shine down on the sodden land. All day the radio reported the aftermath of the rain – people evacuated, some rescued by boat, cars swept away, streets awash, bridges and trees swept away, highways and railways closed as the rivers Lossie and Spey burst their banks. The towns of Fochabers and Rothes and the city of Elgin were inundated. In Aberdeen a month’s rainfall fell in 24 hours, the wettest single day on record. As the day ended there were still flood warnings in force for the River Lossie at Elgin and the River Spey from Fochabers to Spey Bay. In Strathspey there was less rain than further east with 31mm falling yesterday (76mm feel at Lossiemouth) but the River Spey in Grantown-on-Spey was still 5’ 6” above the usual summer level. I walked along the banks watching the surging brown wave-capped waters rushing seawards. In many places the path was under several feet of water and I had to clamber up the bank to the nearby road. Trees and bushes swayed and quivered as the water swirled round them. A few ducks swam up unaccustomed channels pecking at vegetation usually well above the water line. The forecast is for dry weather, at least until late into the next day, when rain may again fall. Then more stormy weather is predicted for next week. This wet summer is not over yet. 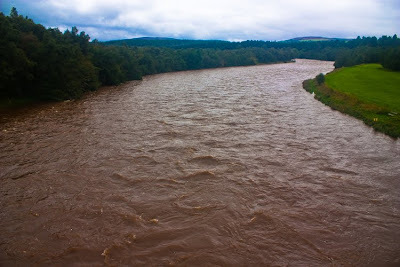 Photo info: The River Spey at Grantown-on-Spey, September 4, 3.30pm. Canon EOS 450D, Canon EF-S 18-55@18mm, 1/200 @ f5.6, ISO 200, raw file converted to JPEG in Lightroom 2.4. The October issue of TGO is out this week (my copy arrived in the post today). 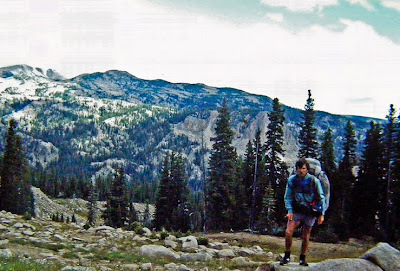 My backpacking column is about the Pacific Crest Trail, which I hiked in 1982 and which I think is the ultimate backpacking trail. Of all the long walks I have done it’s the one I would most like to repeat. In gear I review 15 bivi bags from companies like Rab, PHD, Mountain Equipment, Alpkit and Terra Nova. This is also the TGO Challenge issue with the application form for 2010, reminiscences of the 2009 Challenge, Roger Smith on 30 years of the Challenge and John Manning on the gear he used this year. Elsewhere in the magazine Jim Perrin has a powerful piece, one of his best, on who are the real environmentalists (hint: it’s not those calling for windfarms in wild places); Emily Rodway spends a day with artist Andy Goldsworthy; Andy Stothert walks the Wasdale fells midweek and finds few people; photographer Keith Brame describes spending 2009 taking pictures of the John Muir Trust’s spectacular Scottish estates (and shows some of his splendid images); Graham Forbes gives 50 tongue-in-cheek rules for hillwalking; Steve Razetti looks at the changing face of the trekking business and John Manning looks at gear for trekking. 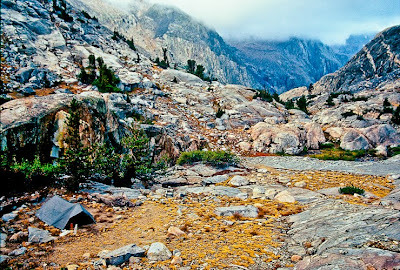 Photo info: Camp in the Palisades Basin, High Sierra, on a return visit in 2002, 20 years after my Pacific Crest Trail hike. Canon EOS 300 SLR, Sigma 24-70 lens, Fujichrome 100 film. Processed in Lightroom 2.4.